I’m going to assume that you’re all familiar with the classic Almond Joy candy bar? If not, it’s a brick of sweet coconut topped with crunchy almonds that has been drenched in chocolate. Sounds good, right? Well, that’s because it is. While I like candy bars, I don’t LOVE them. I can’t give you any specific reasons as to why, but they’re just not my favorite. I prefer to mimic my favorite candy bars in the form of baked goods, specifically these Peanut Butter Stuffed Chocolate Chip Cookie Cups. I think my love of cookies has a lot to do with the fact that they’re so easy to make and require very little waiting. When I get a hankering for something sweet, I want it NOW. Not in four hours or the next day–now! I am not a patient person, folks. These cookies are double the chocolate, and who doesn’t like that, right? The base of this cookie recipe is made with a significant amount of butter. Is it crazy–yes. However, the butter is what makes this cookie so tender and melt-in-your-mouth delicious, so it’s also completely necessary. I love that they stay soft and chewy even after they cool. I loaded the batter with cocoa powder, chocolate chips, and shredded coconut. 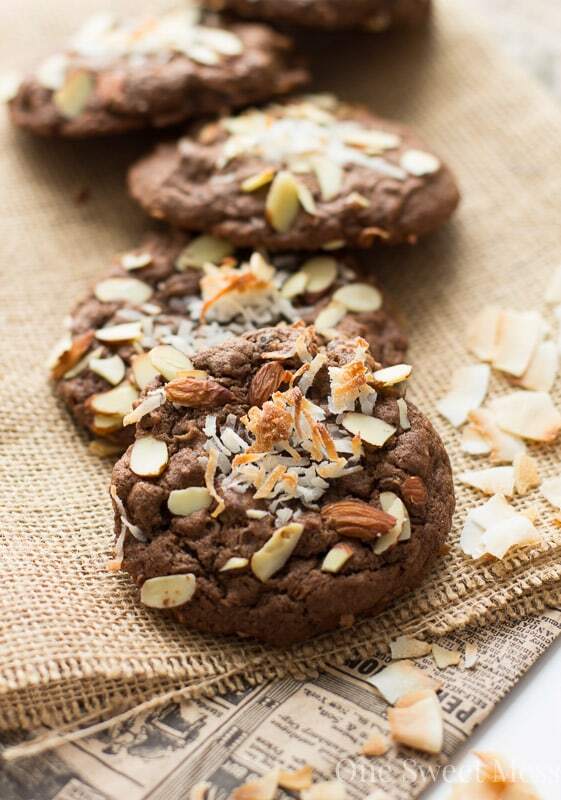 The natural oils in the coconut infuse the cookies as they bake–hello, flavor! Because I absolutely adore coconut, I added a few pinches to the top, along with some sliced almonds. As the cookies bake, the coconut and almonds get all toasty. I only bake the cookies for 15 minutes, so they’ll appear underdone when they come out of the oven, but, I promise you, they’re not. They’ll continue to cook on the baking sheet after you remove them from the oven. Allow the cookies to cool on the cookie sheet completely before storing. They’ll keep for up to 5 days in an airtight container. This recipe was inspired by my Double Chocolate Chip Cookie recipe. This recipe makes 6 giant cookies or 12-14 regular-sized cookies. For that just-out-of-the-oven texture, reheat the cookies in the microwave for a few seconds the next day. Head on over to Food Fanatic to get this Double Chocolate Almond Joy Cookies recipe. These cookies look so delicious! I love almond joy anything and double chocolate is a serious perk! You had me at “double chocolate!” I’m with you on the almond joy thing..I enjoy the candy, but love the idea of a homemade cookie with chocolate, coconut, and almonds more. I would definitely addict myself to these lickety split! My oven is having a break from baking but these cookies are calling my name! These cookies sound amazing! Love the addition of coconut and that they’re giant.